This unique and individual detached property enjoys a superb setting with rural views, located within a small cluster of farm cottages. It is grade II listed and is believed to have previously been 3 cottages with the oldest section dating back to the early 18th century. Included within the sale are approximately 7.1 acres of grazing land and a stone built mistal. ABOUT WATERSIDE HOUSE This unique detached residence is believed to date back to the late 17th century when it was constructed as a pair of cottages, following this a double fronted 2 storey section was added to the rear in Victorian times. The cottages were finally combined and converted into one by our clients during the 1980s when a comprehensive scheme of modernisation was carried out. Many original and period features are on display in the older section of the property most notably the stone fireplaces, mullioned windows, exposed beams and roof trusses. It does benefit from modern fittings to the kitchen and has been well maintained but we fully expect that the next owner will look to make their own mark on the property and redesign it to their own tastes (subject to the necessary consents being obtained). The ground floor accommodation features front and side entrance halls, 4 reception rooms, kitchen and a downstairs WC. 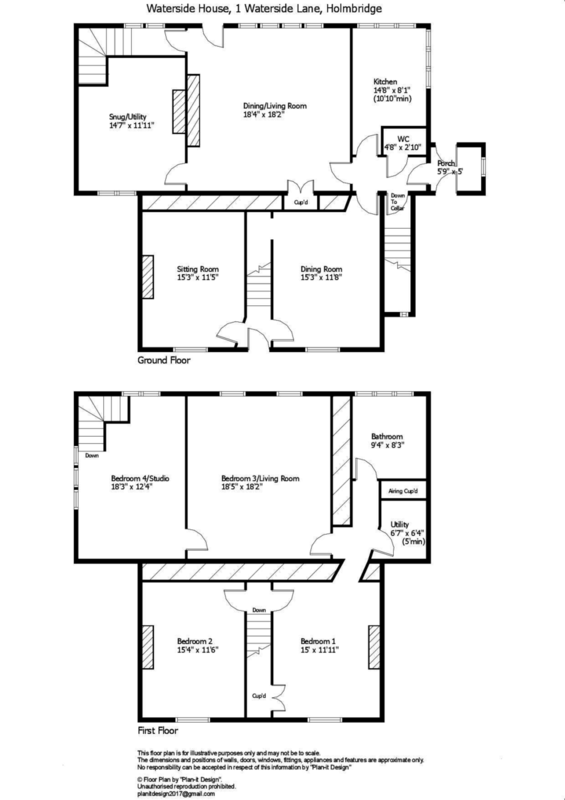 Upstairs there are 2 formal double bedrooms and two further rooms which are currently used as studio and additional living spaces which offer obvious potential to become bedrooms. There is also a utility room and bathroom. The property is situated up an unadopted lane from Dobb Lane with 2 further properties also having the right to access along this lane. Externally there are gardens predominantly to the side and rear of the house. Located below the house there is a stone built mistal, most recently used for housing cattle but having potential for other uses (again subject to the necessary consents). The property comes complete with 3 paddocks of grazing land to the side and rear which we understand amount to approximately 7.1 acres. SIDE ENTRANCE PORCH The "day to day" entrance to the property with a further door leading into the gardens. INNER HALL With tiled floor and door leading to the cellar. DOWNSTAIRS WC With low flush wc and hand washbasin. KITCHEN 14' 8" x 8' 1 (10'10" min)" (4.47m x 2.46m) Fitted with a good range of modern base units and wall cupboards with laminated worksurfaces, integrated dishwasher, fridge, twin stainless steel sink unit with mixer tap, window to the front with exposed stone surround, further window to the side, tiled floor and central heating radiator. DINING / LIVING ROOM 18' 4" x 18' 2" (5.59m x 5.54m) This beautiful room is filled with character and a wealth of original features. The current owner uses it as a formal dining room but it be utilised in a number of ways and possibly converted into a larger farmhouse style kitchen. The key features are heavy exposed beams to the ceiling, mullioned windows to the front, chimney breast with living flame effect gas stove, stone fireplace and hearth, recessed storage cupboard and central heating radiator. Doors give access to a staircase to the first floor and into the snug / utility. CELLAR 10' 6" x 14' 11" (3.2m x 4.55m) With vaulted ceiling and two stone slabs. SNUG / UTILITY 14' 7" x 11' 11" (4.44m x 3.63m) A dual purpose room which could again be utilised in a number of ways. It features a beautiful stone fireplace and exposed beams to the ceiling, central heating boiler and recessed understairs cupboard. There are also mullioned windows to the front and a staircase leading to the first floor - this has been sectioned off with a timber and glazed partition to create a separate lobby area from which to access the first floor. REAR ENTRANCE HALL With wooden entrance door and staircase to the first floor. SITTING ROOM 15' 3" x 11' 5" (4.65m x 3.48m) Featuring a chimney breast with stone hearth and living flame effect gas fire and exposed stone walls to either side, shuttered windows to the rear enjoying the views, beams to the ceiling and central heating radiator. DINING ROOM 15' 3" x 11' 8" (4.65m x 3.56m) With living flame effect gas fire and fireplace surround, stone hearth, exposed beams to the ceiling shuttered window to the rear enjoying the views, central heating radiator and recessed cupboard under the stairs. BEDROOM 1 15' 4" x 11' 11" (4.67m x 3.63m) A double bedroom with window to the rear enjoying the views, recessed louvre door wardrobe (over the stairs), exposed beam and central heating radiator. BEDROOM 2 15' 4" x 11' 6" (4.67m x 3.51m) Another double bedroom, currently used by the owner as a sewing room. With window to the rear enjoying the views, chimney breast with living flame gas fire and boarded ceiling. LOBBY Step down through to a low and narrow doorway from bedroom 1 to access the older front section of the building by way of a lobby area. Doors from here lead to the bathroom, utility and upstairs living / bedroom. BATHROOM 8' 3" x 9' 4" (2.51m x 2.84m) With coloured 4 piece suite comprising low flush wc, vanity washbasin, corner bath and shower cubicle, exposed stonework to one wall window, window to the front with stone surround and sill. LIVING ROOM / BEDROOM 3 18' 3" x 12' 4" (5.56m x 3.76m) Once again we expect that buyers may look to "repurpose" this room which is currently utilised as a living room and office space. It features heavy exposed trusses to the high angled ceiling, exposed stone chimney breast, 2 windows to the front and central heating radiator. STUDIO / BEDROOM 4 18' 5" x 18' 2" (5.61m x 5.54m) This room is accessed via a staircase from the ground floor, it is currently used as a studio but again offers the scope to become a bedroom with some re-configuration. It features a window to the front with exposed lintel over and further window to the side enjoying the views, central heating radiator. OUTSIDE In front of the house there is a small garden area with access to the front entrance door. Opposite the house there is a further garden with greenhouse and parking area. A gateway to the side provides access into the fields. GARDENS There is a pleasant enclosed garden area to the front and side of the house along with a small stone built shed. MISTAL 50' x 20 approx' (15.24m x 6.1m) Below the house there is the remains of a former stone built barn which has largely been demolished with the exception of this stone built mistal with single pitch roof. A further small stone store / building adjoins the mistal. LAND Included within the sale, there are 3 paddocks of grazing land which we amount to approximately 7.1 acres. These fields are located to the side and rear of the house and are enclosed by dry stone walls and hedgerows. Further land may be available by separate negotiation if required. FOOTPATHS Interested parties should note that a public footpath runs up from Dobb Lane, through the land and alongside the eastern gable end of the house. LAND STATUS We understand that the grazing land included within the sale currently falls within the "green belt." It should be noted however that the field in front of the property has been recommended as "Safeguarded" land in the currently proposed Development Plan by Kirklees Council. OVERAGE An overage will be placed upon this land entitling the current vendor of the property to 25% of the uplift in value should planning permission for development be obtained on this land within 25 years of the purchase date. LOCATION Take the A6024 Woodhead Road out of Holmfirth to Hinchliffe Mill. Turn left down Co-op Lane and follow this road along as it becomes Dobb Lane. Waterside Lane will be found on the left hand side, just before Hinchliffe Mill J&I School and the property will be found at the top of this lane on the left hand side.